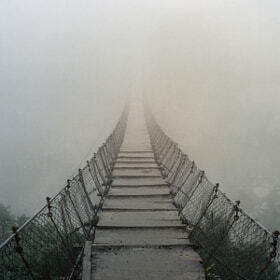 Bridge over Lete Khola near Thakkola (Himalayas / Nepal) - see also my story - Note: This image is scanned from a slide with Hamrick Vuescan on a Reflecta Crystalscan 7200 (Primefilm PF 7250 U). 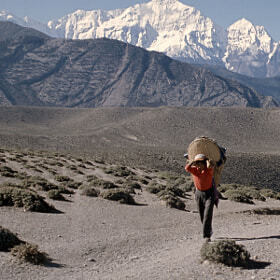 A carrier carrying goods to the pilgimage site of Muktinath through the Kali Gandaki valley in the Himalayas. The peaks in the background are Nilgiri North with 7061 m and Tilicho with 7132 m. Both belong to the Annapurna Himal. - see also my story - Note: This image was scanned from a slide with Hamrick Vuescan on a Reflecta Crystalscan 7200 (Primefilm PF 7250 U). 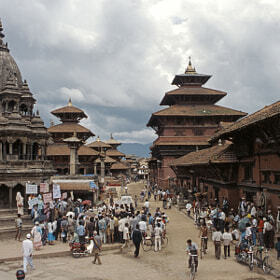 A demonstration on the Patan Durbar Square, Kathmandu Valley (Nepal). - see also my story - Note: This image was scanned from a slide with Hamrick Vuescan on a Reflecta Crystalscan 7200 (Primefilm PF 7250 U). 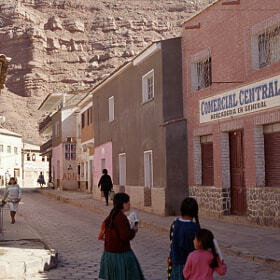 Street scene in Camargo, southern Bolivia. In the background you can see the reddish sandstones forming the Cretaceous Syncline of Camargo. 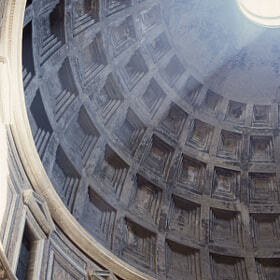 Note: This image was scanned from a slide with Hamrick Vuescan on a Reflecta Crystalscan 7200 (Primefilm PF 7250 U). 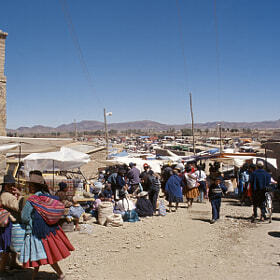 Sunday market in Culpina in the Eastern Cordillera of Southern Bolivia. Note: This image was scanned from a slide with Hamrick Vuescan on a Reflecta Crystalscan 7200 (Primefilm PF 7250 U). 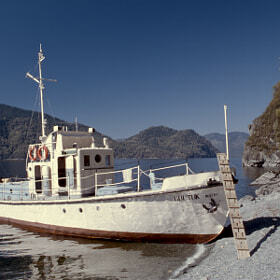 Anchoring the ship at the beach of Telezky Lake, Altai Mountains (Siberia, Russia). "Vostok" means "East". Note: This image is scanned from a slide with Hamrick Vuescan on a Reflecta Crystalscan 7200 (Primefilm PF 7250 U). 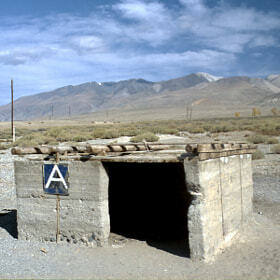 Bus stop in the Altai Mountains near the Mongolian boundary (Russia) Note: This image is scanned from a slide with Hamrick Vuescan on a Reflecta Crystalscan 7200 (Primefilm PF 7250 U). Cabana at the beach of Tulum / Riviera Maya (Mexico) Note: This image is scanned from a slide with Hamrick Vuescan on a Reflecta Crystalscan 7200 (Primefilm PF 7250 U). 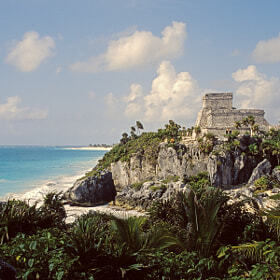 TULUM: Tulum is one of the most recent Maya cities on the Yucatán Peninsula. It was still inhabited when the Spaniards arrived. Its architecture is not very sophisticated... Its the setting that makes these pyramids magic! 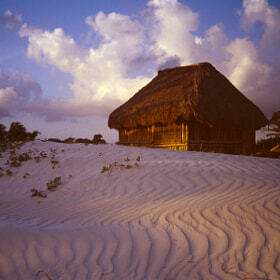 Hints: If you want to visit Tulum sleep in a Cabana at the beach of Tulum. 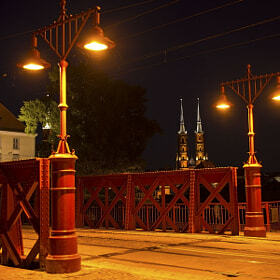 Its more romantic than a ressort or hotel. Go there early in the morning before the busses from Cancún arrive... Note: This image was scanned from a slide with Hamrick Vuescan on a Reflecta Crystalscan 7200 (Primefilm PF 7250 U). 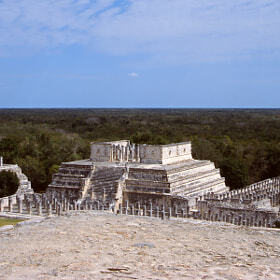 CHICHÉN ITZÁ: The Warriors Temple, the Group of Thousand Columns and the Market seen from the platform of "The Castle" or "Pyramid of Kukulkan", the most famous building of Chitchén Itzá. The Temple is of Maya-Toltec times, the columns are probably Toltec already... Hints: When visiting Chitchen Itza avoid Sundays, when admission is free for locals. Try to sleep nearby and go early before the arrival of the busses from Cancún. Note: This image was scanned from a slide with Hamrick Vuescan on a Reflecta Crystalscan 7200 (Primefilm PF 7250 U). The same photo I took 9 1/2 years ago with an analog camera, this time taken digitally. 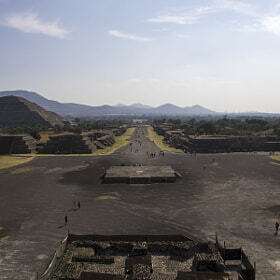 View from the Pyramid of the Moon across the avenue of the death in Teotihuacan. The Pyramid of the Sun is to the left. 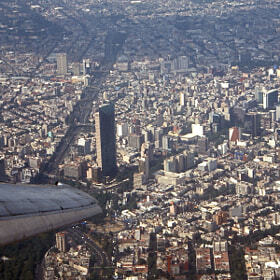 Mexico City: the beginning of the avenue "Paseo de la Reforma" (diagonally through the image) seen from the air with the "Torre Mayor" just at the tips of the wing. Below the wing is Bosque de Chapultepec (Wood of Chapultepec) and the avenue leading from the wing to the north is Melchor Ocampo (Circuito Interior). Note: This image was scanned from a slide with Hamrick Vuescan on a Reflecta Crystalscan 7200 (Primefilm PF 7250 U). 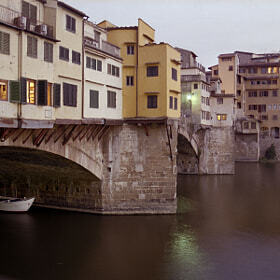 Close-Up of Ponte Vecchio from the northern bank of the Arno River in Florence, Italy. 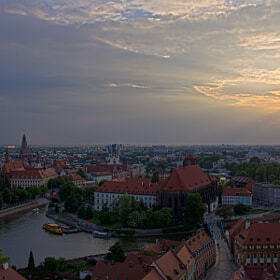 Note: This image was scanned from a negative with Hamrick Vuescan on a Reflecta Crystalscan 7200 (Primefilm PF 7250 U). 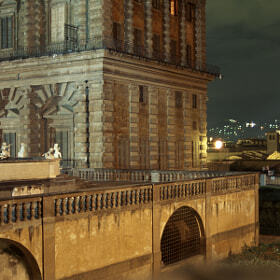 A night shot of Florence, Italy, from the gardens of Palazzo Pitti towards the city center. The tower in the background is from the Palazzo Vecchio at the Piazza della Signoria. Note: This image was scanned from a slide with Hamrick Vuescan on a Reflecta Crystalscan 7200 (Primefilm PF 7250 U). 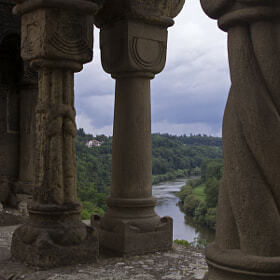 The river Neckar seen through the double arcades of the medieval emperors castle (Kaisepfalz) of Bad Wimpfen. The rivers in this region probably wear Celtic names. So does the town of Wimpfen: "bin" = "mountain" and "uimpe" = "surrounded".